Providing students with an education that challenges them to lead faith-filled lives and prepares them for life in a global society. ​St. Mary of the Assumption School facilitates a wide range of learning for students between the ages of pre-school through eighth grade in our innovative classrooms, science lab, computer lab, library, and gymnasium. Our students also gain a strong introduction to Spanish, art, band, and technology skills, along with partaking in Catholic Youth Organization (CYO) sports and school plays and performances. All curricula developed for elementary schools in the Diocese of Cleveland are, first and foremost, based on the teachings of the Catholic Church. 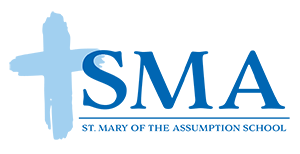 In addition, our curricula reflect the Common Core State Standards and the Ohio Learning Standards. The Diocesan curriculum provides our students with an education that challenges them to live faith-filled lives and succeed in high school and beyond. Religion classes are taught daily and all students attend Mass weekly and on Holy Days. Students also attend paraliturgical services for the seasons of Advent, Lent, Holy Days, and special holidays. Additionally, students take part in service and mission projects. Catholic Christian principles are interwoven throughout the entire curriculum. All children in Grade Two are prepared for the reception of the Sacraments of Reconciliation and First Eucharist. Children who are baptized Catholics will receive the Sacraments. The Pastoral Team will make special arrangements for children baptized in other faiths. Deacon Bill sharing a lesson with students in the gathering center. 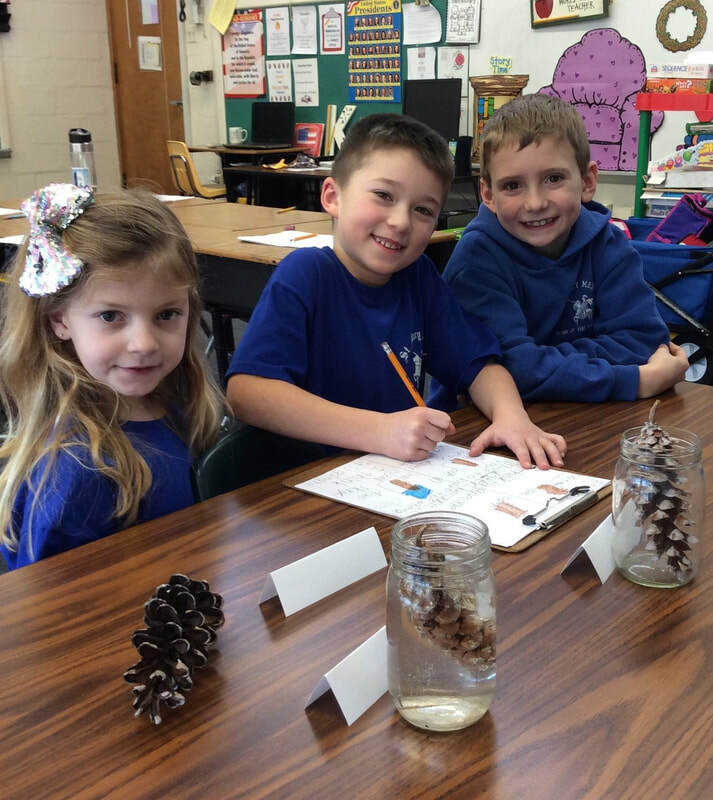 First graders hypothesizing about why pine cones close when it rains. In the primary grades, emphasis is placed on mastering basic reading, writing, mathematical operations, and problem solving skills. In addition to the core subjects, students also have weekly music, art, physical education, and computer classes. ​In the second grade, the religion curriculum focuses on understanding and preparing for the Sacraments of Reconciliation and Eucharist. In the process, students learn that through Scriptures they can hear the messages of God and learn the stories of our Faith. They receive their very own Bible in the beginning of the year, participate in specially prepared parish retreats, and then make their First Reconciliation in the month of November, and their First Eucharist in May. 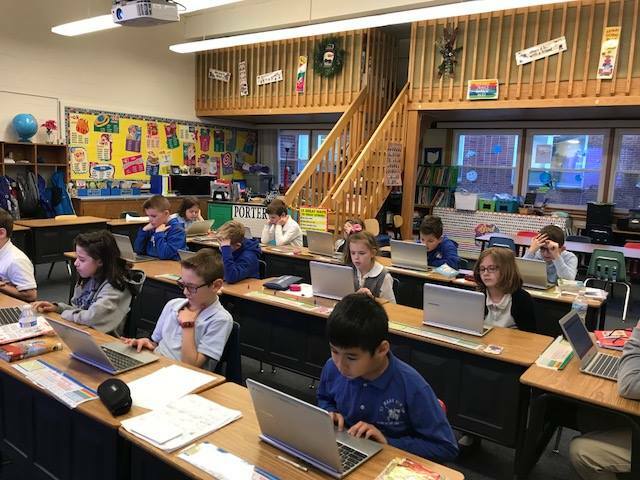 Students in grades 3 through 5 encounter a curriculum focused on religion and the core subjects of math, language arts, science, and social studies. Students attend art, music, physical education, and computer weekly. Teachers utilize problem based learning strategies and develop students' critical thinking skills in order to prepare them for the rigors of junior high. Recognizing that deep learning often occurs outside the walls of the classroom, teachers seek authentic learning experiences to enrich course content. Technology is integrated throughout the curriculum. All classrooms are equipped with SMART Boards. The school also has multiple sets of laptops, iPads, and Chromebooks available to students and recently purchased two 3D printers and Lego robotics kits. Students also utilize Moby Max and Accelerated Reader software to personalize their learning and enable teachers to pinpoint missing skills or gaps. Chromebooks enable 3rd graders to personalize their learning with targeted instruction. 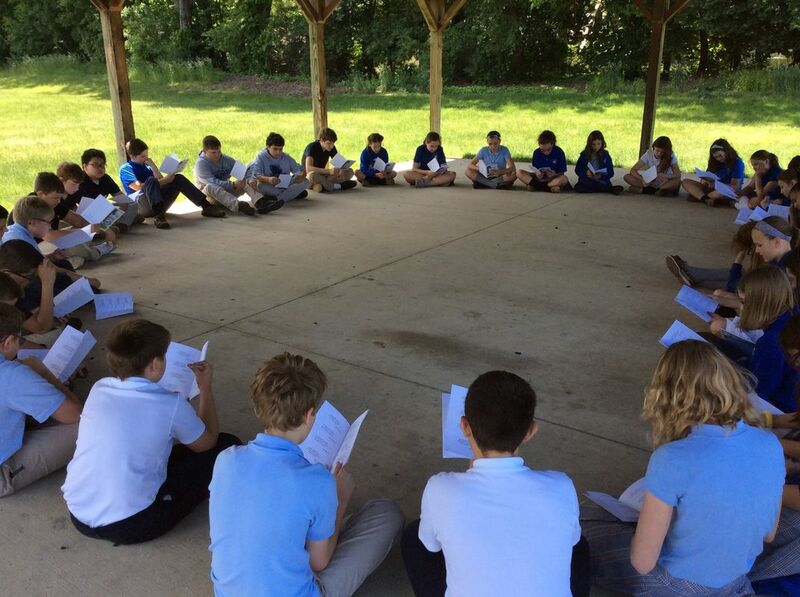 Junior high students enjoy English class outside. The students shared haikus they created for National Poetry Month and concluded the event with a book signing. Religion: Students take a more active role in planning school liturgies. Math: Eighth graders are placed in either pre-algebra or algebra based on their 7th grade scores and teacher recommendations. Our junior high math teacher is a certified high school teacher and many of our students test out of algebra and enroll in Geometry/Algebra II as freshmen. Science: Students are immersed in an earth, life, and physical science curriculum through interactive labs, dissecting frogs and sharks, and preparing science fair projects according to the Northeastern Ohio Science and Engineering Fair guidelines. English: Students read classic and contemporary novels, participate in Socratic seminars, and hone their creative and formal writing skills. Social Studies: An introduction to world history in grade 7 and U.S. history in grade 8 with an emphasis on critical thinking and developing skills needed for active participation in civic life are the focus in junior high social studies classes. Foreign Language: Students in grades 6-8 take Spanish and graduates report placing into honors Spanish or Spanish II as freshmen. Each 8th grader is paired up with a kindergarten buddy at the start of the school year. The program is designed to help ease the transition from preschool to kindergarten, by giving young students an older student whom they can look up to and befriend. Moreover, eighth graders develop a sense of responsibility, patience, and leadership by mentoring their buddy. Throughout the year, buddies sit together at mass and participate in projects. Both classes enjoy the special time that they have together. This program, and countless others, contribute to the welcoming and caring culture that exists at St. Mary of the Assumption School.